Let us now turn our gaze to the man whose job brings him closest to a heart attack every day, the White House Secretary of Prevarication, Sean McSpice. Assaults on democracy come in many guises: Russian cyber attacks, Steve Bannon’s white supremacy, Trump’s conflicts of interest, Paul Ryan’s plan to strip healthcare from 24,000,000 Americans, Mitch McConnell’s anti-Americanism, Tom Cotton’s treachery, Scott Pruitt’s scheme to pollute everyone’s air and water, Betsy DeVos’ dismantling of public education, Kellyanne Conway’s alternative facts (not to mention her alternative integrity), and on and on and on. 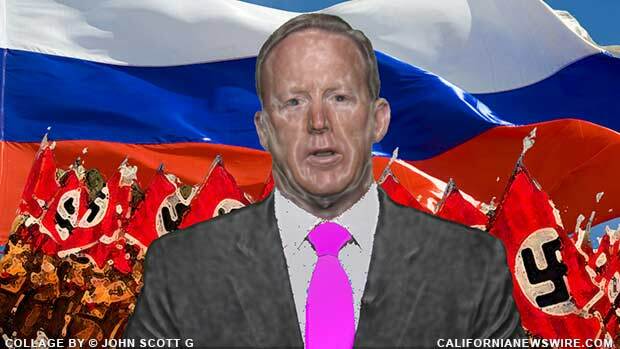 Amidst all of the conservative attempts to destroy American values is the daily equivocation dance performed by shifty-eyed White House Press Secretary Sean Spicer. Or, to use his official title and full name: ErsatzFactsFuhrer Sean Michael Melissa McCarthy Spicy Spicer. There is nothing Spicy won’t say to defend his boss, Donald Trump, our nation’s first illegitimate president. And that is a difficult assignment. Imagine if your job required you to continually praise someone as ignorant, greedy, incompetent, racist, misogynistic, and xenophobic as Donny Danger. But Spicy is up for the down strokes. There is no lie too big, too ridiculous, or too stupid for Sean Spicer. No matter how harmful a conservatard policy may be, Spicy will defend it. Destroying the Public Education System: According to Spicy, there is nothing wrong about Betsy DeVos trying to raise generations of ignorant jebus freaks. “We aren’t going to have much of a future on the planet so what the hell,” is how Spicy puts it. The Goldman Sachs Cabinet: According to Spicy, everything about this is hunky-dory. “It may seem like a problem,” Spicy says, “but it’s $not.” Chided for making such a horrible and juvenile pun, Spicy smiled and quoted lyrics from “The Money Song” from the Broadway musical, Cabaret. Editorial Note: Be aware this series of political articles may contain intentional satire by author John Scott G and is not fully based on fact (aside from some of the stupider things, which are sadly 100% real). Hopefully you can tell the difference?